Due to low tide almost coinciding perfectly with dawn and dusk, I managed to get two fishing sessions in paradise yesterday. Excellent! The morning session fitted in with Paul Smith’s schedule so we arranged to rendezvous at 06.15 am at our normal parking spot. The drive to paradise is a long and winding one which our canine fishing companion Louis was no fan of. Whenever the trip is mentioned I understand he rolled his eyes and fell to the floor with a paw on each side of his head. Consequently Louis was looking fairly green around the gills as he gingerly jumped out of the car. It didn’t take him long to regain his composure though and a saunter around the reserve, coupled with a few three legged pirouettes to water the greenery, and he was back to normal. Despite there being no breeze to speak of, we could hear the constant thud of surf pounding onto the beach. Often when this happens the estuary is slow to drain down to low tide so we opted to wait until there was more light before sauntering across the flats to the main channel. The valleys around the estuary were shrouded in mist and there was no breeze. Perfect fishing conditions. Louis took the lead as we negotiated the eel grass, pockets of soft silt and patches of sea lettuce. As we got to the clear sand and broken shell near the channel it was pockmarked with lots of fresh potholes, a sure sign that there are snapper feeding in the estuary. Paul and I were both fishing so photography was a secondary part of the session. While Paul rigged up I crept up to the channel and lobbed a 3″ Z-Man smoke shad on a 1/4 oz jig head into the current. Unfortunately the tail got wrapped around the hook on the first cast so it was a false start. The second cast was much better and I felt a take as a fish grabbed the tail and “pulled the lure’s pants down” so that the body ended up halfway around the shank. I examined the damage, re-threaded the lure and sent out cast number three. The lure tracked in a beautiful trajectory and plopped in the ebbing current at 1 o’clock, just how I like it. I promptly threw in an upstream mend, wound in the slack and let the lure tap-tap it’s way shorewards in a controlled arc. Three quarters of the way to the shore the lure stopped and I slashed the rod upstream to set the hook. Game on! I yelled “Yep” and heard Paul utter a few profanities as he quickly dropped his rod and struggled to find and fire up the GoPro. The next hour or so was frustratingly similar. The snapper, just like teenage school boys, delighted in “pulling the 3″ Z-Man’s pant’s down” on virtually every cast and we had another couple on only to lose them at long range. I switched to a Yo-Zuri 3D vibe to see if there was any kahawai (or kingfish) around but the lure ended its swim unmolested. 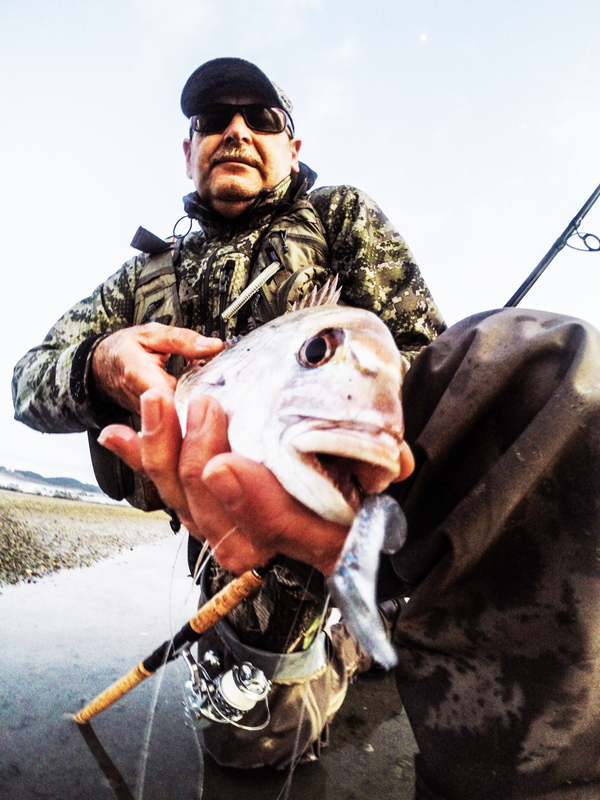 In the end the action started to slow so I rigged up the Loop Booster Predator 8’8″ # 9 weight fly rod that Active Angler NZ had been asked to test and gave it a workout. We’ll be posting a review this week but it is a powerful rod which represents excellent value for money. During the day I thought a lot about how I was going to approach the evening session and counteract the snapper taking short. I came up with a plan and decided to switch to it only if the 3″ lure did not work. It was a hot day in paradise with very little breeze of substance. As I strolled across the flats again at 6.20 pm a cool, light breeze sprung up from the SE to take the edge off the oppressive heat. Tellingly the wind strength never reached more than 5 knots which made fishing effortless. Sunset was set to occur around 7.35 pm and as it approached clouds began to build around the hills, big fluffy specimens almost akin to thunder clouds. These clouds were backlit with a vermillion hue and coupled with a fairly dense haze, very similar to pollen clouds. I idly wondered if this was due to the cyclone due late tomorrow. I started at my usual spot with 3″ Z-Man on 1/4 oz jig head and worked steadily upstream against the ebbing tide up to a cluster of moored boats. As had happened earlier in the day the Z-Man regularly had “it’s pants pulled down” as smaller fish grabbed paddle tail incessantly. In the end after a hour or so I executed my cunning plan, changing down in size to a 2″ Ripple Shad. I then returned to starting spot and began working my way downstream with the faltering current to yacht moored near a major side-stream. Progress was initially very slow with more attention coming from ravenous horse mussels than fish. However things started to pick up once the sun set. By now I’d reached the yacht and I was fairly confident that there would be fish holding under it in the half light. Out went the lure. It arched towards the yacht and the tail must have brushed the hull as it dropped into the tide, inches from it. The lure sunk to the bottom and I carefully wound in the slack. The tide flow was anaemic by now so the lures progress down stream was tortoise slow. Eventually I felt a tentative tap, then another. Ten seconds elapsed before the fish returned and had another peck. It couldn’t resist having another gnaw and this time I felt the line tighten. Up came the rod and I felt solid resistance. The fish took off like it had been Tasered and the drag on the IRT let out a prolonged “Yeeehaa” as braid hissed off the whirring spool. 30 metres of braid evaporated in the first searing run. Then the head shaking started and the fish went deep, hugging the bottom and fighting the pressure that was drawing it to the shallows. This to-ing and fro-ing continued for several minutes so to break the cycle I started to walk backwards. The snapper gave up at this point and was beached in short order, only running once more when it’s belly touched the sand. 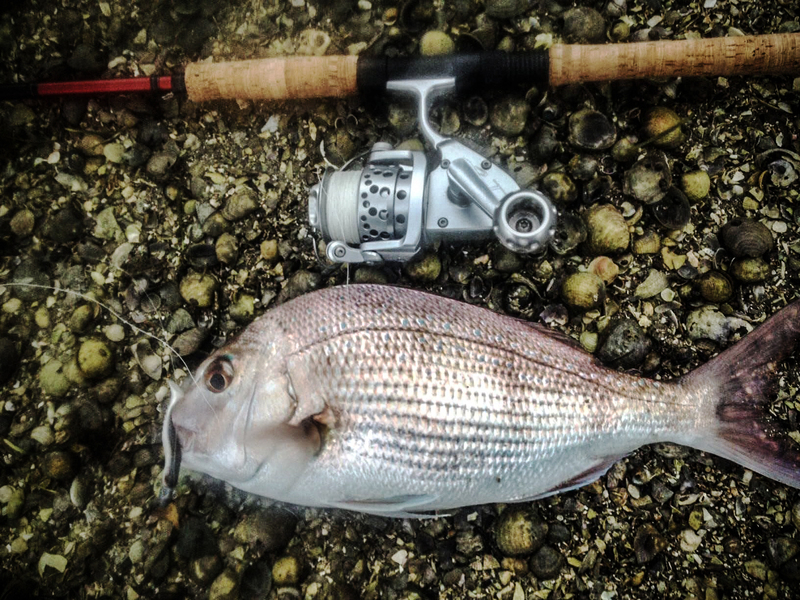 It was a 40 cm (3 lb) snapper, above average size for the estuary at this time of the year. A hard earned prize that was the perfect 85th birthday present for my mother. I thoroughly enjoyed both sessions and, despite being on the same day, both were totally different. There is nothing like stalking the flats on a sunny day in paradise. Well played Alan, cant remember the last time I got it twice in one day. Agree on your maxim with relation to measuring, and enjoyed seeing the snapper returning to the deep leaving only a swirl across the salty surface. You need to plan your days better Stuart. Pounce at every opportunity. Go hard or go home. Thank you for your insights and kind words Gary. Very interesting.